Why did I read this book: I am not one for passionate paranormal romance, adult or YA, and reading another Romeo and Juliet retelling in the vein of Twilight/Hush Hush/Shiver whatever makes me want to throw up in my mouth. So, when I read the synopsis of this book – with the intriguing premise that one of our most iconic love stories is actually a lie, and Juliet and Romeo are immortals locked in a centuries-spanning war – I was instantly hooked. Though not without its weaknesses, Juliet Immortal managed to surprise me and, ultimately, win me over. Although the book isn’t quite what one would expect given the premise of the novel, it’s a beautiful story of self-discovery and the ability to love, even in the face of impossible adversity. Easily the best paranormal YA romance that I have read in a very long time, I wholeheartedly recommend Juliet Immortal to lovers of romance, and to those who long for a more empowered heroine in this very popular genre. Sounds amazing. I’ll be picking this up soon. oohh..glad to hear this one was good! it’s been on my radar for awhile now. So glad to hear this one has more to it then most paranormal romances. I really wanted to read this one, but have been put off the genre by Twilight, Hush Hush, Starcrossed etc where its the same old tired ‘romance’ *coughobsessioncough*, filled with mostly unhealthy relationships and useless female heroines. I now feel I can pick this one up in good faith! I love your reviews. You’ve put me on to so many great books. Thanks for the comments, everyone! 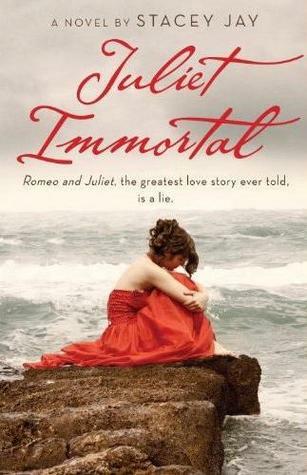 I really, really hope Juliet Immortal works for you awesome folks the way it did for me. Does Romeo still love Juliet or did he just court and marry her to kill her so he could be immortal? Such a cool idea! I’ve seen this cover in a couple places and loved it, but didn’t spend too much time reading the synopsis (the title really doesn’t do it for me) But as always, great review…off to purchase right now 😉 Thanks! Great review. This one is on my TBR but I wanted to hear what others have thought. I like it’s not another Twilight/Shiver. Curious though-like KB-did Romeo ever really love Juliet? Btw, very good book review!You write very very well. The book has an interesting concept but the idea of Juliet helping soul mates while Romeo tries to corrupt them, is a little far fetched. Overall, I liked the book. There is going to be a sequel, from where the book left off!!! It comes out October 9, 2012, it’s called: Romeo Redeemed. I can’t wait!!! I can read this book so many times if there was a movie to go with it! !